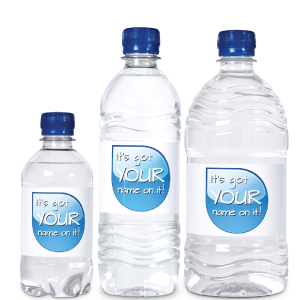 Promotional Water can help promote your brand, business, club or charity through branded mineral water. Imagine only selling water with your own brand on it, don’t promote someone else on your water anymore. Our Water comes from a natural source in the countryside, which has supplied water for over 20 years. We pride ourselves on the quality of our water. This can be used for your events too. Perhaps at a conference, training day or seminar. Make sure your corporate image is maintained throughout the whole day. Water 24-7 offer water for your business in both Glass and Plastic bottles. Plastic bottles of Promotional Water start at as little 13.5p* a bottle. You can add your own mark up and make a huge profit. We provide a simple, professional label design service for your bottles. Simply supply a print quality logo and we can do the rest. Want certain layout or wording ? No problem, call us with our bespoke requirements. We’re always happy to get your brand across exactly how you want. Give us a call today on 01606 24-7 24-7 to discuss your promotional water needs. *price indicated for large bulk orders.